Nile cruises from Hurghada and Nile cruise holidays for 4 nights and 5 days to get full Egypt experience and discover the ancient world of pharaohs. Transfer to Luxor by a privat a/c van. 17:00 pm In the early morning optional visit to Abu Simple temples. Pick up/drop off from Hurghada hotel. Transfer by a private a/c van to Luxor and back. 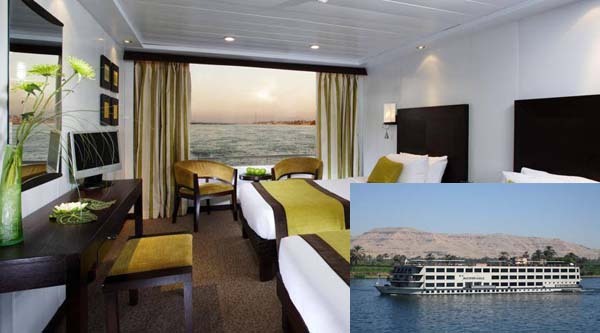 4 nights Nile cruise on 5* Deluxe boat on FB (full board) basis. 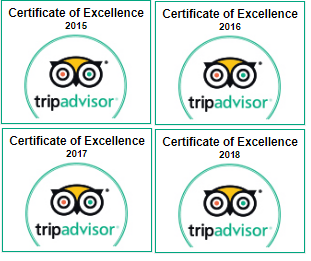 Licensed English speaking Egyptology tour guide. Entrance fees to sites as per the itinerary. Alcoholic, soft drinks and drinks with meals. Optional activities in Aswan or Luxor. Tipping: your guide may ask for approximately $15 per person for tips which will go to drivers, temple guards, the crew. We do pick up from any hotel in Hurghada including Makady bay (extra 10 GBP per person). Pick up from your hotel in Hurghada and transfer by a private a/c van to Luxor. It may take up to 4 hours to reach the city. We will 1st visit Colossi of Memnon. Next stop at the Mortuary Temple of Hatshepsut (Deir el Bahari) – this is the most beautiful temple in the necropolis and the queen herself is one of the most colourful figures in ancient Egyptian history. the Valley of the Kings is a remote valley deep in the limestone hills to the north-west of Deir el Bahri. Your visit includes entry into 3 tombs, however if you wish to see either the tomb of King Tutankhamen or Tomb of Ramses VI, there is an additional ticket cost. Afternoon check in your floating hotel. Lunch on board, some rest and continue exploring the city. Karnak temples exploration - this great national monument of Egypt has no equal. Don't forget to have a look at Karnak Open Air Museum as well(optionally with extra ticket cost). Back to the boat for dinner and evening entertainment program, overnight in Luxor. In the early morning after the breakfast we'll start our Aswan city tour. We will visit the High dam which is situated 6,5 kilometres south of the original Aswan dam built in 1902 & subsequently heightened on 2 occasions. Then move behind the Dam to visit unique Nubian site known as New Kalabsha with its temples and chapels (optional activity). Our next goal will be a jewel of Upper Egypt, a beautiful small Philae island. To reach the extraordinary temple of Philae island we will sail by a feluca boat. The original monuments of the island was dismantled & re-erected on another island called Agilkai, slightly to the north of Philae. So, this is the place we are visiting these days. Lunch on board and optional afternoon visit to Botanical garden. The island is one of the oldest gardens in the world & includes a rare collection of tropical plants which have been collected from all over the world. Also optionally you can visit Elephantine island and discover ancient Nilometers. Overnight and evening entertainment program on board in Aswan. In the early morning optional visit to the famous huge temples of Abu Simbel or the Nubian village. In the afternoon transfer from Aswan to your Hurghada/Makady bay hotel. It may take up to 5 hours. Once again, many thanks Sharm Club. We took a wonderful holiday of Nile cruise on 26th December. Our guide Ahmed was just as good as our guide in Cairo - Sherife. In fact at the end of the day, I asked him if he was an Egyptologist. His reply - "I just want to be a good guide" does not do him justice. The whole day was mind blowing and the organisation - as in Cairo - was faultless. Thank you Sharm Club - and especially Ahmed.